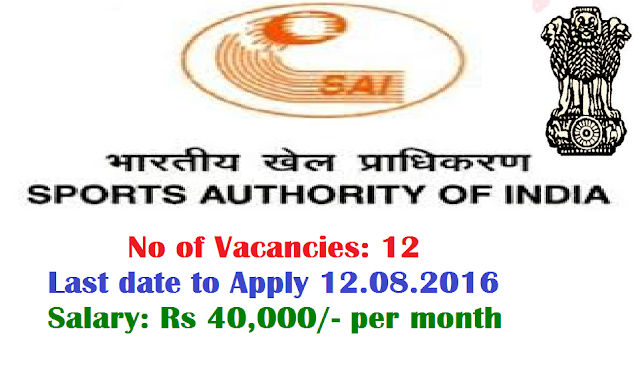 Sports Authority of India SAI Recruitment Notification for Young Professionals , Govt of India Sports Authority of India released Notification for the Recruitment of an autonomous organization under the Ministry of Youth Affairs and Sports, Government of India invites applications for engagement of Young Professionals on contract basis initially for a period of one year extendable upto a maximum three years for Mission Olympic Cell and National Sports Academies. Tenure:The contractual engagement will be initially for a period of one year which could be further extended for a maximum period of three years. Remuneration:Fixed Monthly remuneration of Rs. 40,000/- will be payable. Tax Deduction at source:The Income Tax or any other tax liable to be deducted, as per the prevailing rules will be deducted at source before effecting the payment, for which the SAI will issue TDS Certificates/Service Tax, as applicable. Other Allowances:No TA/DA shall be admissible for joining the assignment or on its completion. No other facilities like DA, Accommodation, Residential Phone, Conveyance /Transport, Personal Staff, Medical reimbursement, HRA and LTC etc. would be admissible to them. Extension:Performance of the Young Professional would be continuously reviewed and their extension will be considered on the basis of performance review reports. Leave:They will be entitled for 08 days leave in a calendar year on pro-rata basis. Therefore, Young Professional shall not draw any remuneration in case of his/her absence beyond 08 days in a year. Also un-availed leave in a calendar year will lapse and will not be carried forward to the next calendar year.